As we have discussed before, boots are the most essential pieces of your ski equipment. The boot is what connects you to your ski. Every movement that you make with your ankle should have an immediate impact on the behavior of your skis. If you have a lot of extra room in your boot, your skis will not respond to your motion correctly. Think about it and try to find the best fitting size for yourself (normally it will be the same as your shoe size, but only trying different models and spending 15-20 minutes in them could really tell you whether it is the right choice or not). When you begin to look for new boots, first go to several different reputable ski shops that will take the time to help you find the right fit and performance level. A knowledgeable boot fitter can help you find a perfect match. Ask yourself a few questions. What did I dislike about my old boots? Were they too stiff? Too soft? Too wide? Too narrow? 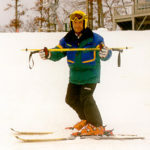 Has my skiing changed since I got them? What terrain do I ski? Do I attack or just tool around? Be honest — otherwise you could get an uncomfortable fit and a boot that makes skiing more difficult and less enjoyable. Your top priority is getting a secure, snug fit around your foot. This is the single most important factor in determining how the boot will perform. The most common mistake is buying a boot that is too big. Usually it happens with a lot of high-end models, as it is very hard to insert your foot into them. Remember you have to buy the boot according to the size from the sizing chart, available in any ski shop. In fact some shops will even have different charts for different model. So for instance size 8.5 Lange may not necessarily the same as Nordica of that size. They may simply have a different volume and width. So once again, trying different boots and wearing them inside the store for at list 15-20 minutes is the key. Boot liners are very cushy at first, but they will conform to your foot in 10-15 minutes, and after several ski days, they can really pack down. What feels so perfect in the store often feels sloppy and uncontrollable on the hill. The correct boot should feel snug all over without pressure points. If it feels too tight initially, almost enough to make your eyes bulge, it’s probably about the right size. Make sure it’s snug around the heel and ankle. This is crucial for initiating your turns. If your heel slides up as you flex forward, try a different boot. (Lifting your heel up is not a good test — you can do it in nearly every boot.) What else should you feel? A little ankle pressure. Your toes may touch the front when you’re standing straight up, but when you flex the boot by pushing your knee forward, your toes should draw back. This is a good indication that the length will be right once the liner breaks in. Pay attention to boot flex. 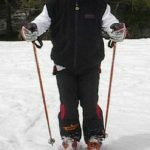 A boot with a very stiff flex, one that moves very little when you push your knee forward, will turn the ski quicker but also will transfer vibrations from the ski to your leg and body. A softer flexing boot won’t turn the ski as quickly but will do more to smooth out terrain changes. Don’t buy the first boot you try on. Though it may seem that there couldn’t possibly be a better-fitting boot, you won’t know until you try more. Then, once you’ve found the perfect fit, make it even better: add a custom insole. 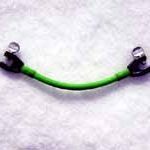 This will hold your foot in a stable position and allow you to turn your skis more quickly and with less effort. With your foot stabilized, you’ll also feel fewer pressure points. Finally, fine-tune the fit. Many of this season’s boots feature the ability to adjust everything from cuff width to stance to forward flex. Use the cuff adjustment to center your lower leg in the boot. Try different stiffness settings and angles of forward lean. Lower-leg length and calf size can affect these adjustments, so experiment. Now it’s time to ski. Be patient for the first day or so — every boot needs to break in. And once it does, you’ll be set for years.